Bored with chicken and rice? Try our chicken and couscous recipe instead! 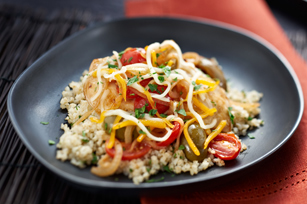 Skillet-cooked chicken breasts are served with whole-wheat couscous and a medley of fresh vegetables in this tasty HEALTHY LIVING entrée. Bring broth to boil in small saucepan on medium-high heat. Add couscous. Remove from heat; cover. Let stand 5 min. Meanwhile, heat oil in large nonstick skillet on medium-high heat. Add chicken; cook 6 to 7 min. on each side or until browned on both sides and done (170ºF). Transfer to plate; cover to keep warm. Heat dressing in same skillet. Add onions; cook and stir 5 to 6 min. or until crisp-tender. Stir in tomatoes and olives; cook 1 to 2 min. until just heated through. Add 2 Tbsp. parsley to couscous; mix lightly. Spoon onto platter; top with chicken, tomato mixture, cheese and remaining parsley. Prepare as directed, substituting 2 rinsed cans (540 mL/19 fl oz each) chickpeas (garbanzo beans) for the cooked chicken. Add to dressing in skillet with the onions. Here's a tasty and colourful way to eat couscous. And as a bonus, the tomatoes provide an excellent source of vitamin C.